Words like sleek, sporty and smooth just aren’t the norm for people movers, are they? Take a look at the Citroen Grand C4 Picasso and that mind-set might change. Making a vehicle that, more often than not, performs Mini Bus duties to look exceptional is a challenge, but a challenge that Citroen has rose to. Rounded panelling, big wheel arches and a chunky low waste-line provide the canvas that Citroen uses for painting the beautiful detailing work over the Grand C4 Picasso. Segregated lenses penetrate the road ahead from narrow LED daylight housing, and straight away a styling statement is made with the night time headlamps also being slim and sleek. The iconic Citroen logo has been integrated, in chrome, into the bonnet lip at the front, while a deep apron at the front has large air intakes for striking looks. The huge raking windscreen reaches well into the roofline, and added to the big panoramic sunoof, the natural lighting is exceptional. 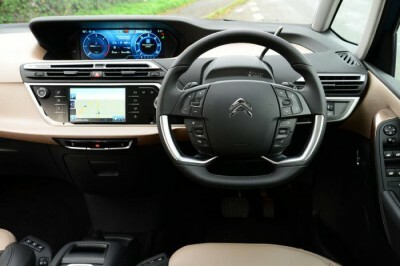 Citroen have provided the Grand C4 Picasso with exceptional looks. Only the Honda Odyssey comes close to matching it. Inside the Citroen Grand C4 Picasso are numerous clever seating arrangements that can be made for the rear seat rows. Seven people are catered for in sumptuous comfort. The third row of seats has the added bonus of being able to be raised or lowered at the touch of a button. Second row seats have a ‘cinema mode’ where the base can be raised in an upright position. You could be forgiven for feeling that you’re travelling on an aeroplane with the neat little foldaway table that sits into the front seat backs. There’s nothing like sitting in the rear seats and enjoying the journey with food and drinks at hand. Life in the front seats is outstanding, with the Citroen Grand C4 Picasso boasting front seats with electric lumbar support, massage function and an electric foot rest for the front passenger. The Citroen Grand C4 Picasso also comes with plenty of luggage space, and if you lower all the rear seats an exceptional 2181-litres is at the ready for receiving all sorts of cargo. Even with all the seats up, the Citroen Grand C4 Picasso offers an impressive 645-litres. Futuristic styling has always been a characteristic of many French cars, perhaps more commonly associated with the Citroen and Renault brands. When you sit yourself down in the beautifully crafted driver’s seat, a wide dash envelopes two large screens that are the focal point of your dash fascia attention. A massive 12-inch high definition screen displays all your driving information, and can even be customised to display a photo of your own choice as a screen background. The multi-function 7-inch touchscreen connects you to other amazing features. An in-built jukebox system stores your favourite music and then pumps out the tracks through six beautifully clear speakers. USB, Bluetooth with media and satellite navigation are also features of the 7-inch touch screen. Steering wheel controls are standard. Climate control keeps the people-moving cabin nicely balanced, while electric windows and a massive panoramic sunroof add to the great Grand C4 Picasso experience. The Citroen Grand C4 Picasso also has power at the ready. When the motorway opens up, the efficient 2.0-litre turbo-diesel can really perform. A top speed over 200 km/h gives the new Grand Picasso long legs, and the impressive 370 Nm of torque from 2000 rpm pulls superbly. A combined fuel economy cycle in the mid fours is impressive enough, but for a people mover this is outstanding. I recommend kitting your new Citroen Grand C4 Picasso with the 18-inch alloys. Their striking design makes for an even sportier appearance. Ride and handling is well above average. 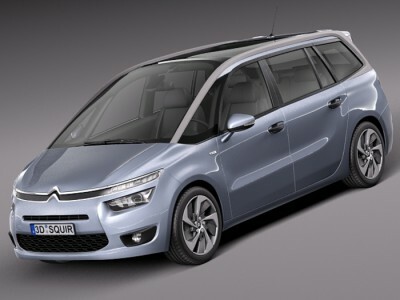 There are plenty of exterior and interior colours to play with to make your new Grand C4 Picasso the perfect match. For any more information on the Citroen Grand C4 Picasso or, for that matter, any other new car, contact one of our friendly consultants on 1300 303 181. If you’d like some fleet discount pricing (yes even for private buyers! ), we can submit vehicle quote requests out to our national network of Citroen dealers and come back with pricing within 24 hours. Private Fleet – car buying made easy!